Kim Kardashian might have a few weeks to go until her due date, but she looks ready to pop already. 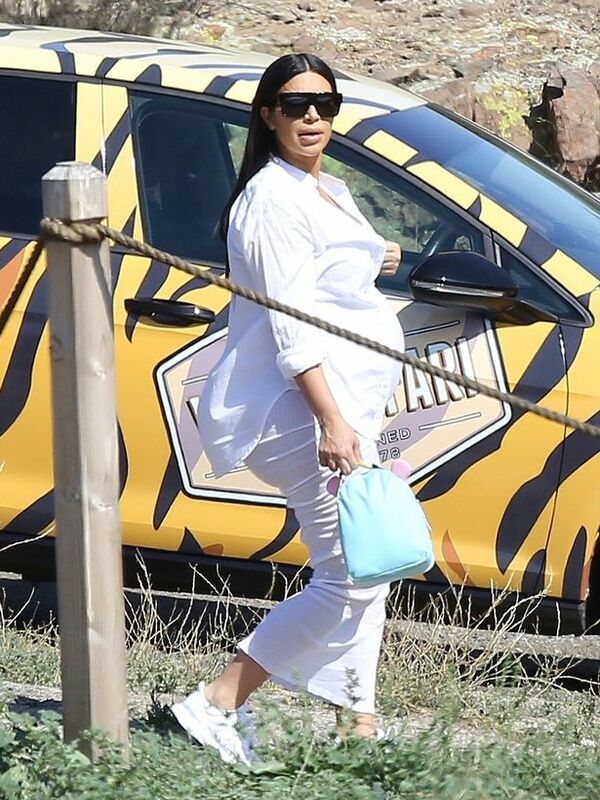 The reality star showed off her ever-growing baby bump in a skintight white outfit this week, as she joined her family touring around a stunning vineyard in Malibu. Once again opting for a figure-hugging skirt, Kim added a matching open shirt and proudly showed off her front to the camera. Despite the heat and long walk she appeared relaxed and happy, as the arrival of her second child edges closer. Kim was joined at the ranch by her mum Kris Jenner and her partner Corey Gamble, along with baby dad Kanye West and sister Kourtney Kardashian. While Kim dressed for summer in her all-white outfit, the others opted for black as they enjoyed the rays. Meanwhile Kourtney matched her sister perfectly in a loose white shirt and tiny denim shorts, flashing her glowing tan and long legs. The happy parents all snuggled up to their kids, as Kourtney’s children Mason and Penelope rode a tour jeep up at the front, with North sat between Kanye and Kim. Kim recently spoke out about her changing body and how she feels about pregnancy – branding it the ‘worst experience’ of her life. Previous article New Apple Watch: Most Useful Baby Accessory Ever? Next article Chrissy Teigen and John Legend: We’re Pregnant!